A transition to low carbon energy faces multiple challenges, here I discuss two: that posed by the low capacity factors of renewable energy and the challenge posed by the requirement for power plants to run with reduced capacity factors. On a sunny Saturday afternoon in May 2012 Germany got over half of its electricity from its solar panels. This story was heralded by too many environmentalists as showing that solar power was now contributing large amounts of energy – in some accounts Germany now gets 50% of its electricity from solar year round – and that the German roll out was a resounding success story. Instead it indicated that solar power is a far from appropriate technology for a cloudy country such as Germany. This is shown by contrasting the electricity Germany got for a couple of hours on that May afternoon with the rest of the year. In descending order: it got around 20% of its electricity from solar that day, around 12% from solar that month, and only 4.6% from solar for the entire year. In other words if Germany was to get only 10% of its electricity from solar, it would have days when it gets 100% of its electricity from solar. And quite clearly expanding beyond 10% will pose significant challenges. Here we have a simple illustration of the multiple challenges posed by the preferred capacity factors of low carbon power plants. The capacity factor of a power plant is defined rather simply, it is its average power output divided by its maximum power output. Actual capacity factors vary significantly and are determined by multiple factors. The first is the role a power plant plays in the electricity grid. In fundamental respects the total generating capacity on a conventional electricity grid (i.e. one with little intermittent renewables) is determined by peak electricity demand, which for example is 60 billion watts (60 GW) in the UK. Power plants are not always available to supply electricity into the grid, so the total capacity is normally peak demand plus change, around 10% in many countries. However electricity demand is mostly below peak demand, for the simple reason that very few people are awake at 5 AM in the morning to consume large amounts of electricity. In the case of the UK average demand is about 40 GW, which translates to an average capacity factor of around 60%. However not all power plants have identical capacity factors. Turning to the United States, in 2009 the average capacity factor for coal plants was 63.8%, for gas plants 42.2%, and for nuclear plants 90.3%. The reasons for these differences is primarily that their running costs are different. Typical electricity grids buy electricity from power plants on the basis of which has the lowest running osts at that particular time. The typical order here is nuclear cheapest, then coal and then gas. However this has recently been upended by the diffusion of shale gas in the US. Cheaper natural gas has resulted in a significant increase in capacity factors for US gas plants, and a reduction in both the capacity factors of coal plants and in turn carbon dioxide emissions. A transition from low to high capacity factor gas plants and from high to low capacity factor coal plants has the potential to be a significant climate change mitigation wedge. In contrast typical renewable energy plants currently do not have capacity factors determined by market forces. Their main determinants are when the sun shines and when the wind blows. Solar panels have capacity factors below 10% in cloudy Germany, whereas they are 20% in the more suitable Arizona. Average solar radiation in Arizona is 22% of its maximum, therefore a capacity factor of around 20% should be viewed as a physical upper limit to capacity factors in Arizona. The difference between peak output and average can be significant, last year peak output (22 GW) was seven times higher than average output (3.2 GW) in Germany. Wind speeds vary significantly globally. Therefore it is unsurprising that capacity factors will also. Boccard (2007) calculated that European wind farm capacity factors varied from a low of 18% in Germany to a high of 26% in the United Kingdom. The past however should not necessarily be viewed as an accurate reflection of the future. Diffusion of onshore wind farms may result in a reduction of average capacity factors as better sites are used up. In contrast diffusion of offshore wind farms should see increases to average capacity factors. Germany provides a good illustration of this. At the start of 2012 it had 28.8 GW of wind power installed, and wind farms produced 45.9 TWh of electricity, which equates to an average capacity factor of 18%. However offshore wind farms rarely have capacity factors below 30%, and future German offshore wind farms are more likely to average much closer to 40% than the national onshore average of below 20%. Therefore German wind farm capacity factors should increase significantly if more offshore wind farms are built. Let’s reconsider that hypothetical future where Germany gets 20% of its electricity from solar power. Germany would then often be generating far more electricity from solar than it can consume. Similar conditions to the May 2012 record of 22 GW of solar would result in around 200% of electricity supply from solar and an excess of around 40 GW. However Germany was also producing 4 GW of wind power at the same time. It’s very difficult to see Germany decarbonising without the majority of its electricity coming from wind power. Let’s say then that in this hypothetical future Germany gets 50% of its electricity from wind instead of the 8%. It would therefore be producing 60 GW more power from wind and solar than it would be consuming on this May afternoon. Germany therefore would have three choices: export the electricity, store it, or curtail it. Only the second two are credible long term options. After all if Germany’s neighbours install lots of renewables capacity they too will probably want to export it at the same time, for the simple reason that solar output peaks in Germany at very similar times to its neighbours and wind speeds are very correlated. Denmark appears to be able to get 50% of its electricity each year from wind without significant curtailment. However higher penetrations will cause greater problems. 70% from wind will result in approximately 30% of wind power either being exported, stored or curtailed. Fortunately Denmark is heavily interconnected and can probably export this electricity to hydro heavy Norway and Sweden, or Germany. Denmark’s average electricity demand is 4 GW, yet its export capacity is almost 6 GW, a benefit shared by few other countries. We can repeat this exercise with German solar. The much lower capacity factor for German solar, 10% versus around 30% for Danish wind, means we expect expansion of solar to be much more problematic. The graph below shows that up to 20% there will be limited curtailment of solar power due to supply outstripping demand. At 40% penetration half of the energy produced cannot be consumed in Germany. These estimates show solar is not very scalable in Germany, however they also underestimate the challenges it faces. Consideration of the effects of the large scale diffusion of wind power would make the graph below much worse. I will leave this point for a future column. Repeating this exercise for German wind farms gives us the graph below. These approximations indicate that Germany will need to curtail, or store, two times more wind electricity (in percentage terms) than Denmark if both countries were to get 50% of their electricity from wind power, reflecting the higher capacity factor of wind power in Denmark than in Germany. These numbers however should not be viewed as realistic projections. Low power density of wind power means a large expansion of onshore wind in Germany will face very significant social and political challenges. Therefore the capacity factor of German wind power is likely to increase significantly and potential curtailment will be much lower. Regions where wind farms have higher capacity factors therefore will in general require less curtailment of wind electricity. This is one of many secondary, but important considerations that need to be considered when weighing up the costs of intermittent energy sources. 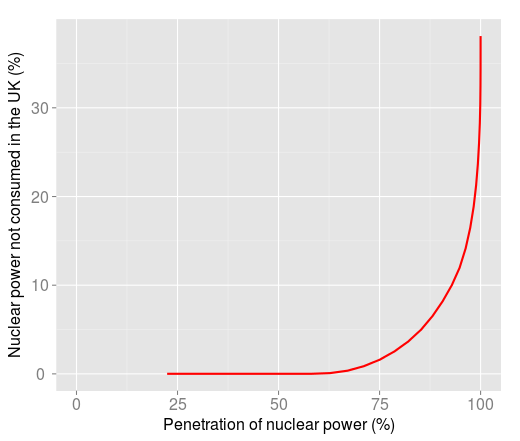 Up until around 60% penetration there is little need to curtail nuclear power plants. However this need grows very rapidly above a penetration level around 75%. This simple engineering appraisal also rules out the likelihood of 100% nuclear power coming any time soon. It will be much cheaper to get 75 or 80% of electricity from nuclear and to use low capital cost gas plants to fill in the gaps. The same holds for renewable energy. I will close by drawing brief attention to another under discussed issue: the problems caused by the electrification of heating, in this case in the United Kingdom. The British government have proposed to decarbonise heating in large part through the diffusion of heat pumps. Here I will not consider the efficacy of heat pumps, a controversial issue, but will highlight their possible impact on UK electricity demand. As shown by a recent paper, UK gas demand for heating is much more seasonal than current demand for electricity. A consequence of this is that the electrification of heating will significantly reduce the average capacity factors of British power plants. The challenge posed by this is made clear by a report for the UK government’s independent advisors on climate change. Element Energy estimated that electrifying the majority of UK heating, largely in the form of heat pumps, would result in peak electricity demand for electric heating of 65 GW. This contrasts starkly with their estimate of average electricity demand for electric heating: 11.4 GW. In other words the UK electricity grid would require the addition of around 65 GW of capacity that would only operate at an average capacity factor of 18%. Meeting this load largely with low carbon energy appears extremely difficult, if not impossible. Meeting this with nuclear power would be challenging from an engineering and economic perspective. Meeting it largely with direct, i.e. not stored, wind energy would probably require a politically unfeasible area to be covered in wind turbines. However an alternative approach, now gaining some traction, is to convert excess wind, nuclear or solar electricity into methane and use this directly in gas furnaces in homes (and as back up in gas power plants). The rough idea of Power-To-Gas is this: you capture carbon dioxide from somewhere (the current trial in Germany captures it from a biogas plant), use excess electricity from wind farms to first produce hydrogen via electrolysis and second to combine the hydrogen and carbon dioxide to produce methane, which can then be pumped into the gas grid. If this is proved workable it is a potential solution to the low capacity factors of renewables. Multiple challenges are faced however. Carbon capture is expected to impose an efficiency penalty of 20-30% on whatever process is producing the carbon dioxide in the first place, and impose greater capital costs on these plants. Conversion of excess wind electricity to methane is also expected to be at most 60% efficient. Therefore if we are converting excess wind energy to methane and then running it through a modern gas plant to produce electricity the overall process is just over 30% efficient, and below 30% if we factor in capturing the carbon dioxide. Things look slightly better if you are running it through a 97% efficient furnace in someone’s house. However the economics of this look challenging. An even bigger problem may be that we are capturing carbon dioxide from somewhere, moving it around a little, and just pumping it in the atmosphere in the end anyway. The extreme difficulty of decarbonising industrial processes means that partial recycling of carbon in this way may not go that far, however a full life cycle analysis would be necessary to confirm how scalable this would be without requiring the abandonment of emissions targets. A final problem is that we need to find sources of carbon dioxide. Biogas power plants are a far from scalable energy source (and often have dubious “low carbon” credentials), and a decarbonised energy system may lack gas plants that emit large amounts of carbon dioxide to be captured economically (consider that a decarbonised electricity supply will require gas plants to run below 15% capacity factor, hardly “carbon capture ready” capacity factors.) And if you are capturing carbon dioxide why not just shove it underground and be done with it? Scalable low carbon alternatives to 97% efficient gas furnaces then may be difficult to come by. These are only a few examples of the challenges posed by the capacity factors of low carbon energy. None of the above is to suggest one energy source is in general better than another. Solar power may have a lower capacity factor than wind farms in most locations, but this does not necessarily imply that wind is more scalable than solar. As recent research shows solar power, in sunny locations, is more suitable than wind power for battery style energy storage. The relative scalability of energy sources therefore is highly dependent on the future development, or lack of development, of energy storage techniques. Political – how many countries will commit to nuclear energy? -, social – how many wind turbines are densely populated countries willing to accept -, and ideological – the world’s largest solar farm was not built in Germany because of sound economic or engineering analysis – will determine the penetration of low carbon energy sources as much as anything else. However their rates and limits of diffusion will always be limited by physical and engineering realities.